This strikingly beautiful Indian sword is in superb condition and has significant religious associations. The long, sweeping blade is of agreeable proportions and is made from pattern-welded steel. It has two slim fullers that reside near the spine: one of which terminates not far from the centre of percussion while the other continues towards the tip. The hilt is richly adorned with Devanagari inscriptions set against a gold ground that is stippled and subtly chased with lines and depictions of birds. The inscriptions are religious in nature and adorn every section of the hilt, even appearing on the quillons. The sweet Lord, the enchanting flute player enamouring hearts. The one who pleases hearts, in order to obtain him people perform oblations and do worship for days. Lord Shri Nath Ji, Shri Nath, the lord, went to Nagor and graced it with his holy feet. The holy child, son of springs, this happened with the blessings of the goddess and Pranam to Devi. Salutations to Shri Dalbhanjan, Shri Gau Gange, Valla Vikala, shri saksam mohun, radhe radha radhe shri shri. Lord whose sublime touch blossoms the water of Yamuna, Lord Govind, companion of Haldhar and Sudama, Namo to him. The end of both quillons read “Shri”. The sword’s references to Shri Nath Ji suggest a significant connection to the shrine of Nathdwara. Shri Nath Ji is a manifestation of Krishna, first appearing from within Govardhan Hill and adopting the form of a black seven-year-old child. The Rajasthani town of Nathdwara is sacred to him and houses his principle shrine, a temple that dates to the 17th century. This connection to Nathdwara is supported by Jens Nordlunde in his 2016 book A Passion for Indian Arms in which there is shown an enamelled sword inscribed with “VJ & son(?) Nathdwara”, so we know that swords were made, or at least decorated, there. 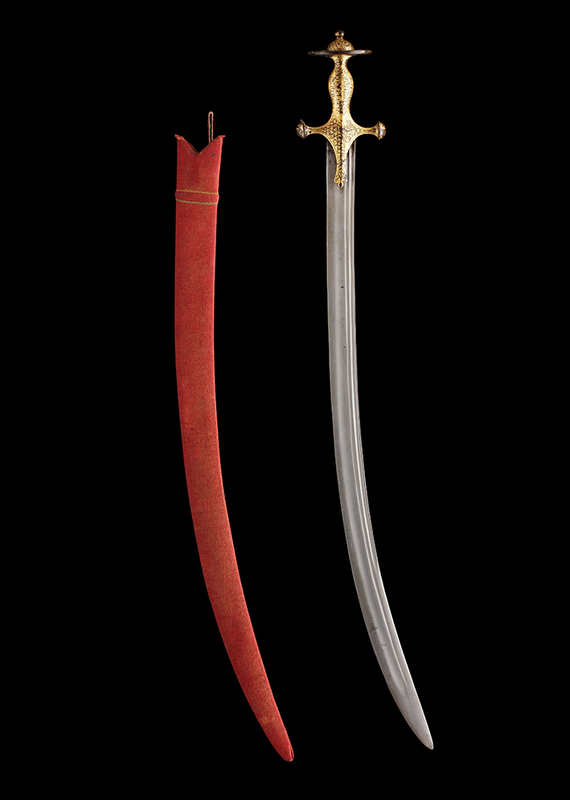 The sword’s scabbard is wooden and has been covered with red silk velvet. It is original to the sword and in remarkable condition, even retaining the colourful cord that loops over the reverse quillon to hold the weapon securely within it. Weapons with inscriptions like this one’s are seldom seen on the market, but another can be found in this publication—please see catalogue number 6. T. H. Hendley, Damascening on Steel or Iron as Practised in India, W. Griggs and Sons Ltd, 1892, p.14 pl.7A. J. Nordlunde, A Passion for Indian Arms, 2016, p.190.